In this fifth episode of I Live In Dallas Radio show, co-hosted by myself and Jason Channell, we interview Dallas Foodie, who is a long-time contributor to ILiveInDallas.com, owner of DGdesign (a Dallas social media marketing company), and recently was named by CBS Local as one of 10 Best DFW Foodies to Follow on Twitter. This Internet radio show was recorded at Private Social in Uptown. Private Social is located on the main strip of McKinney Avenue near other Dallas Uptown favorites like Frankie's Sports Bar, Bread Winners Cafe and Bakery, Primo's, and other prime people-watching places. In this radio show, we ask Dallas Foodie (whose real name is Danielle Glick) about her currently ongoing article, "30 Days of the Best Foods in Dallas". Dallas Foodie is extremely active in food and drink events, festivals, tastings, and shows in Dallas, so these 30 foods were chosen from her several years of food tasting experiences in Dallas. She is a walking Dallas food events calendar and cornucopia of insider knowledge on Dallas restaurants and bars. Dallas Foodie reveals a few of the best Dallas foods she has yet to publish in her "Best Foods" article. State Fair of Texas "Best Taste" Fried Food Winner - Deep Fried Jambalaya. Photo by Dallas Foodie. We have a friendly debate on the popular topic of Best Burger in Dallas (with a mini "burger altercation"). We get the scoop on something we missed this year, but can look forward to next year. It's a little-known piece of a larger annual September festival, where for $20 you can sample dozens of Texas wines in a "People's Choice Wine Tasting" (you might already be familiar with the festival, but you'll need to listen and take note of this specific high-value wine tasting that happens every year). Learn about an Oktoberfest event happening near Dallas this weekend with tons of German beer, food, rides, and crafts. If you're not aware of it and how to get reduced ticket prices, you'll need to get the low down. A popular and historic Greek festival in its 56th year, happening at the end of September. How you can see celebrity chefs Paula Deen and Bobby Flay this weekend in Dallas at the Metro Cooking Show. Where to experience 12+ of the best Dallas chefs' dishes all-in-one-place, also this weekend, at Food for Thought. Dallas Foodie reviews her 2012 State Fair of Texas Best Fried Foods and gives us insider info about how to eat the best tasting fried foods from past years' fairs. 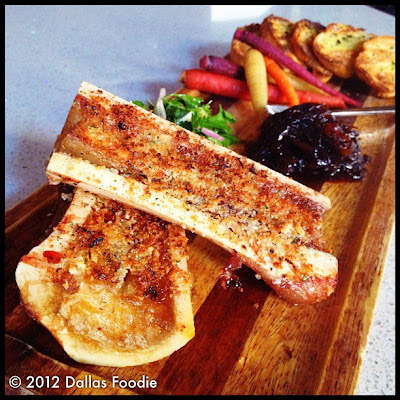 The Bone Marrow we discuss at Private Social. Photo by Dallas Foodie. Lastly, other amazing Dallas restaurants and dishes were referenced in a collaborative I Live In Dallas article, titled 25 of the Best Dallas Restaurants According to Five Local Foodies, which includes Dallas Foodie's picks. Follow her in Instagram by searching "Dallas_Foodie"